We have to always keep in mind that our patient is an emotional being. They too can get hurt, can feel joy and sadness. When we get older, we tend to feel like as if we are growing apart from our friends and loved ones. As a result, we often feel lonely, and this loneliness can become a depression that most people would not easily recognize. As a provider of care, we can do something about this before it happens. We can alleviate that sad feeling from loneliness by spending quality time with them. Here at Peachtacular Home Health Care, we have seen the marvelous effect of spending time with the patient. This should be the time spent for quality conversations, and a lot more! Based on our experience, elderly people appreciate it a lot. For us, it is always nice seeing them with a big smile on their face. Like what we said a while ago, seniors tend to be very emotional. We can uplift their spirit by speaking encouraging words to them. Just like anyone of us, we love to hear words that would not crumple our heart. There are so many encouraging words that you can think of. You can say those words while doing personal care to the person. Perhaps you can also encourage the person during your quality conversation time. It does not matter when, where, and how you will do it. Surprise them one of these days with a comforting and encouraging word, and we tell you – it will brighten up their day! As a provider of care, the principle of service is no longer unfamiliar to us. However, there is so much to learn about this principle that you can’t just put it in a box. One may serve, but without a full heart. A good service is done out of the fullness of one’s heart. Because of the love and compassion the person has, it will no longer hard for him or her to serve the patient sacrificially. What we mean by this is that providing care is no longer just a responsibility that must be finished every single day, but for someone who serves sacrificially – it has already become a joy and a privilege. When you serve sacrificially, you serve without minding what’s in it for you in the end. It is unconditional. It is rewarding. In our Home Health Care in Metro Vancouver, it has become our tradition to surprise our patients with a gift. Even during the most ordinary days of all, we give them presents because we believe that they will appreciate it. Giving gifts to anyone, not just seniors, is a sign of thoughtfulness and love. In the same way, we incorporate this mere activity into our care plan. Over the years, we’ve witnessed how it affects the lives of our patients, and how it has changed their perspective towards healthcare. Touch is actually a nonverbal way of communicating to patients. It has been proven effective in communicating feelings of love, compassion, and support to people. Likewise, we incorporate this method into our daily activities. Whenever our healthcare professionals do One on One Personal Care to our patients, they either pat their back or hold their hands to show to them that they are well-supported and cared for. These are some of the effective methods in providing care for an elderly patient in our Home Health Care in Metro Vancouver. 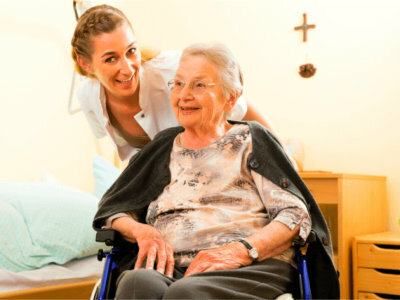 Our healthcare professionals at Peachtacular Home Health Care are highly trained to provide care to our patients. If you want more information, you can give us a call at 778-859-2695.